CNN has learned US authorities wiretapped Paul Manafort, the spin artist for dictators who worked a tumultuous four-and-a-half month term as Donald Trump’s campaign manager in 2016. According to CNN, the FISA court-authorized surveillance continued before and after he worked on the campaign and initially “centered on work done by a group of Washington consulting firms for Ukraine’s former ruling party.” The first warrant was discontinued before Manafort started work on Trump’s campaign in May 2016, though resumed with a separate FISA warrant later that year amid widespread rumors he could be connected to an alleged Russian intelligence operation to manipulate the elections. Three sources said the government obtained evidence Manafort “had encouraged the Russians to help with the campaign,” though two of them told CNN it was not conclusive. 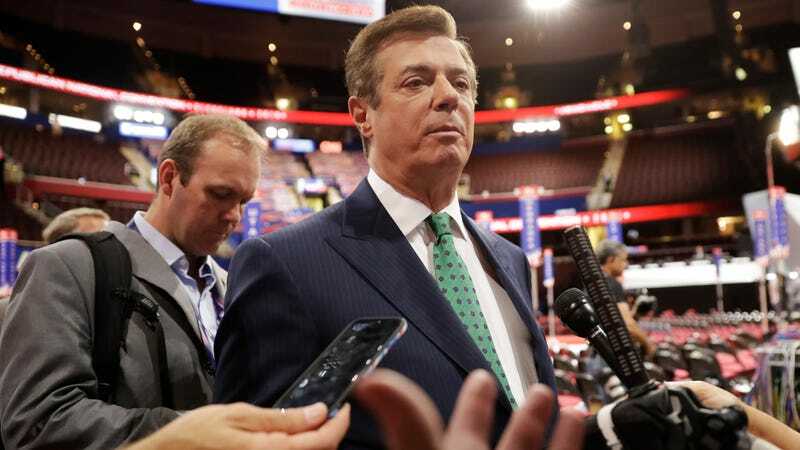 In the original investigation, Manafort’s firm as well as two others—the Podesta Group and Mercury LLC—came under suspicion after they performed extensive work for former Ukrainian leader Viktor Yanukovych’s Party of Regions government. Evidence of Yanukovych’s corruption is extremely widespread, per the New York Times, and documents show his government designated $12.7 million in undisclosed payments to Manafort from 2007 to 2012. The second investigation into Russian electoral interference, of course, is still the subject of a wide-ranging inquiry by Department of Justice special investigator Robert Mueller. Another New York Times story on Monday indicated federal agents working for Mueller served a search warrant on his home in July 2017, looking for evidence of offshore accounts and threatening an indictment. CNN noted because Trump maintained contact with Manafort for long after his campaign, including when it was publicly known the FBI was looking into him, it’s possible he was picked up on some of the surveillance. Earlier this month, Trump’s own Department of Justice admitted it could not back up the accusation. The president can complain all he wants about investigations of his associates. But if Trump was incidentally picked up on the Manafort wiretaps, perhaps he should have been a little more judicious about his choice of advisers. Just kidding. Even a minimal level of introspection doesn’t line up with the Donald we’ve come to know so very, very well.